Harbour Rock provides interim CFO services for growing businesses. Their marketing story was one that too many growing businesses experience – the story of fly-by-night marketing tactic vendors claiming they can save the day with a fancy new website or SEO program. Finding the perfect match for a business’s marketing needs is no easy task. 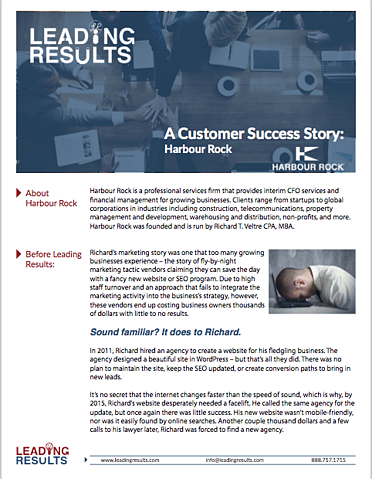 After searching for a new agency, Harbour Rock connected with Leading Results. Nervous about choosing a new marketing partner for fear of getting burned again, Harbour Rock met with Leading Results in Charlotte, NC for a two-day workshop. The resulting website and marketing plan restored the team’s faith in marketing.